Grundy Television Pty. Ltd / Channel 7 / Channel 10. x30mins. 1985. 45 (OP)	BBC. UK. RESL 210. 1987. Side a: Neighbours. v: Barry Crocker. 45 (AD) Columbia. UK. DB 9166. 1988. Side a: Neighbours. 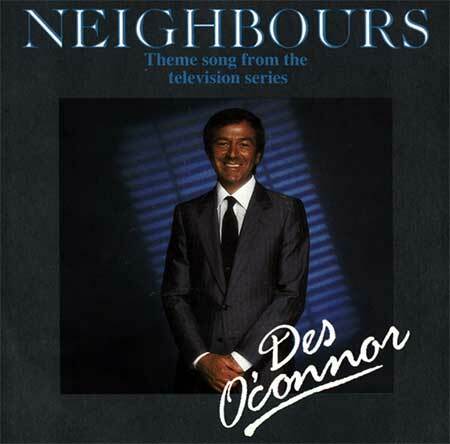 v: Des O'Connor. LP (OP)	Fable. FAB 793200. 1989. (CD EMI. CDP 793200). Produced by Russell McKenna and Tony Naylor. A “Rusty Nails” Production. Arranged by R. McKenna & Tony Naylor. Recorded at David Briggs Production Workshop. Engineered by David Briggs. * Traditional. Arr: Russell McKenna and Tony Naylor. ** Arr: Russell McKenna and Tony Naylor. Cast: Anne Charleston, Ian Smith, Stefan Dennis, Anne Haddy, Alan Dale, Annie Jones, Paul Keane, Jessica Muschamp, Mark Stevens, Rachel Friend, Kristian Schmid, Sally Jensen. Stefan Dennis appears by courtesy of Central Station Records and Tapes Pty. Ltd.
Good King Wenceslas. * (2:30). (Image). We Wish You A Merry Christmas. * (Image). The Twelve Days Of Christmas. * (3:48). Away In A Manger. (Luther). ** (1:48). Rudolph The Red Nosed Reindeer. ** (2:03). I Saw Three Ships. * (2:02). God Rest Ye Merry Gentlemen. * (3:09). O Come All Ye Faithful. * (2:45). Santa Claus Is Coming To Town. (1:52). The First Noel. * (3:52). (Nelson - Rollins). (J. Albert & Son). Ding Dong Merrily On High. * (2:00). The Little Drummer Boy. (2:46). (Simeone - Onorati - Davis). (Chappell). Deck The Halls. * (1:00). While Shepherds Watched. * (1:45). Intro. Spoken; Christmas Caring. (3:58). (R. McKenna - T. Naylor). (Image). 45 (OP)	RCA. 105099. 1989. Arranged & Produced by Mike Harvey. Engineered by Glen Phimister. Side a: “In Your Arms (The Love Song From “Neighbours”)”. (3:30). (Peter Pinne - Don Battye). v: Lynne Hamilton & Peter Rice. 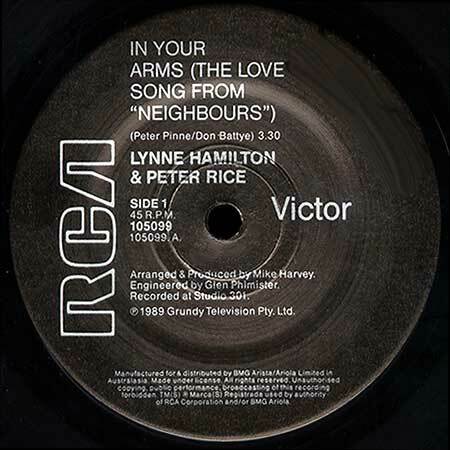 Side b: “In Your Arms (The Love Song From “Neighbours”)”. (3:30). (Peter Pinne - Don Battye). v: Lynne Hamilton. EP/12(t)(AD)Epic. 654503 6. 1988. “DAME EDNA”. Produced and Arranged by David Mackay and Don Reedman. S1-Tk1 “Neighbours (Caring And Sharing Mix)”. (3:10). (Tony Hatch - Jackie Trent). (Control). 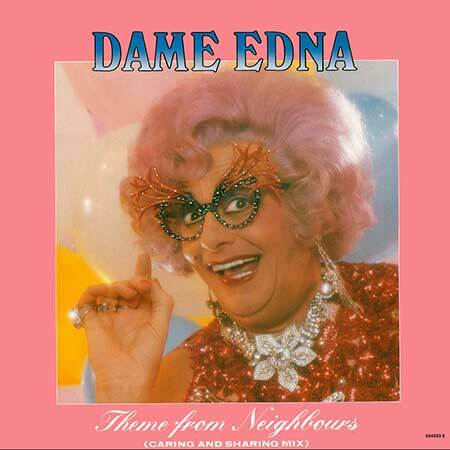 v: Dame Edna Everage. LP(t) (AD)	Epic. 463235 1. 1988. 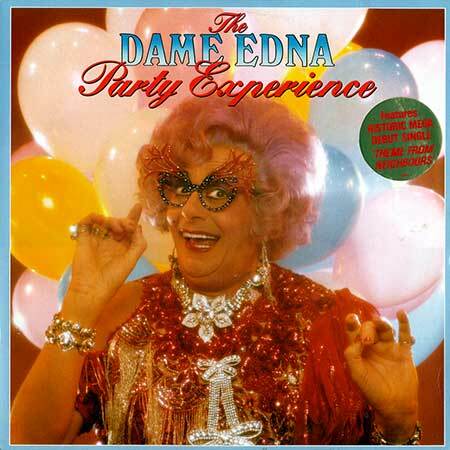 “THE DAME EDNA PARTY EXPERIENCE”. S2-Tk4 “Neighbours”. (T. Hatch - J. Trent). (Control). v: Dame Edna Everage. 45 (OP)	Mushroom. UK. MRI 02. 1990. 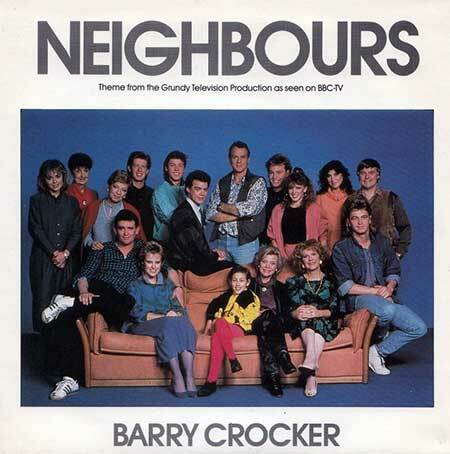 Side a: Neighbours Theme (Episode 2001). CD (OP) Columbia. 5100662000. 2003. 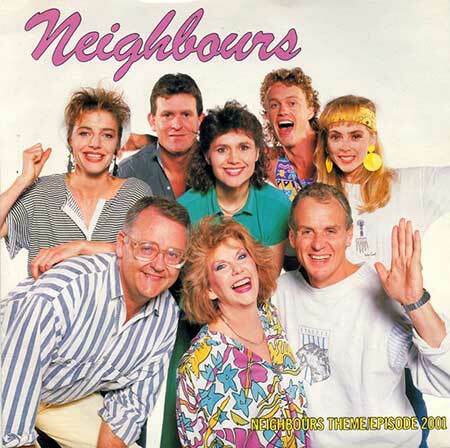 (CD + DVD) "NEIGHBOURS: THE MUSIC". 02. Born to Try. Delta Goodrem. 04. Way Love's Supposed to Be (Album Version). Selwyn. 06. Stop Callin' Me (Album Version). Shakaya. 08. Three Dimensions. Something For Kate. 09. What Now My Friend. 10. He Don't Love You (Album Version). Human Nature. 12. Takin' Back What's Mine (Album Version). Leah Haywood. 14. Afterwords (You're So Right). Endorphin. 16. Hard. Stella One Eleven. 01: Kiss Kiss (Wise Buddah Mix) (Video Version). Holly Valance. 02: Born to Try (Video). Delta Goodrem. 03: Locomotion (Video Version). Kylie Minogue. 04: He Don't Love You (Video Version with Holly Valance). Human Nature. 05: Too Many Broken Hearts (Video Version). Jason Donovan. 06: Mona (Video Version). Craig McLachlan and Check 1-2. 07: Don't it Make You Feel Good (Video Version). Stefan Dennis. 08: Mad if You Don't (Video Version). Gayle Blakeney and Gillian Blakeney. 09: Suddenly (Video Version). Angry Anderson. 10: Especially For You (Video Version). Kylie Minogue and Jason Donovan. 2CD (OP) Liberation Music. LMCD0270. 2015. "NEIGHBOURS: 30 YEARS". Neighbours Theme 1985. Tony Hatch / Jackie Trent, Mr & Mrs Music, © 2014 Fremantle Media Australia Pty Ltd. Licensed courtesy of Fremantle Media Australia Pty Ltd. I Should Be So Lucky. Matt Aitken / Mike Stock / Pete Waterman, Universal Music Publishing Pty Ltd / Sony/ATV Music Publishing Australia Pty Ltd / Universal Music Publishing MGB Australia, © 1988 Mushroom Records Pty Ltd. Licensed courtesy of Warner Music Australia Pty Ltd.
Geronimo. George Sheppard / Amy Sheppard / Jason Bovino, Mushroom Music Publishing, © 2014 Empire of Song (Australia) Pty Ltd. Licensed courtesy of Empire of Song (Australia) Pty Ltd.
Let’s Dance to Joy Division. Haggis / Knudsen / Murphy, Mushroom Music Publishing, © 2007 14th Floor Records. Licensed courtesy of Warner Music Australia Pty Ltd.
What’s So Bad (About Feeling Good)? Ben Lee, Sony / ATV Music Publishing Australia, © 2009 Ben Lee. Licensed courtesy of Universal Music Australia Pty Ltd.
22. Greg Kurstin / Lily Allen, EMI Music Publishing Australia Pty Ltd / Universal Music Publishing Pty Ltd, © 2009 Parlophone Records Ltd, a Warner Music Group Company. Licensed courtesy of Warner Music Australia Pty Ltd.
Beautiful Mess. Kasey Chambers, Mushroom Music Publishing, © 2010 Essence Music Pty Ltd, under exclusive license to Liberation Music for Australia and New Zealand. From Afar. James Keogh, Mushroom Music Publishing, © 2013 Liberation Music. This Old Love. Lior Attar, Mushroom Music Publishing, © 2006 Lior. Licensed courtesy of Lior / Mushroom Music Publishing. Letting You Know. Philip Norman, Mushroom Music Publishing, © 2013 Fremantle Media Australia Pty Ltd. Suddenly. G. Anderson / A. Cichon / K. Beamish, Mushroom Music Publishing / Control, © 1986 Mushroom Records Pty Ltd. Licensed courtesy of Warner Music Australia Pty Ltd.
Born to Try. Delta Goodrem / Audius Mtawarira, Sony/ATV Music Publishing Australia, © 2002 Sony Music Entertainment (Australia) Limited. Licensed courtesy of Sony Music Entertainment Australia Pty Ltd.
Tease Me. Paul Kelly / Bruce Haymes, Mushroom Music Publishing / Sony/ATV Music Publishing Australia, © Paul Kelly. Licensed courtesy of Gawd Aggie Recordings and One Louder Entertainment. Hurt Me. Shannon / McGlone / Lockwood / Kaloper, Mushroom Music Publishing, © 2009 The Jezabels. Licensed courtesy of The Jezabels. . Bury Me Deep In Love. David McComb, Mushroom Music Publishing, © 1987 Liberation Music. Wishes. Klippel / Glass, Mushroom Music Publishing / Universal/MCA Music Publishing Pty Limited, © 1996 Sony Music Entertainment (Australia) Limited. 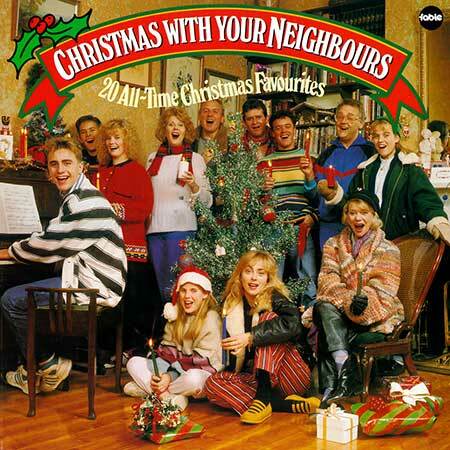 Licensed courtesy of Sony Music Entertainment Australia Pty Ltd.
Neighbours Theme 2015. Tony Hatch / Jackie Trent, Mr & Mrs Music, © 2014 Fremantle Media Australia Pty Ltd. Licensed courtesy of Fremantle Media Australia Pty Ltd. Especially For You. Matt Aitken / Mike Stock / Pete Waterman, Universal Music Publishing Pty Ltd / Sony/ATV Music Publishing Australia Pty Ltd / Universal Music Publishing MGB Australia, © 1989 KDB Pty Ltd. Licensed courtesy of Warner Music Australia Pty Ltd.
Cherry Lips (Go Baby Go). Erikson / Manson / Marker / Vig, Mushroom Music Publishing, © 2001 STUNVOLUME. Licensed courtesy of Liberator Music. Voodoo Child. Steve Davis / James Appleby / Elvis Costello, Universal Music Publishing MGB Australia Pty Limited / Orient Pacific Music Pty Ltd, © 2005 Sony BMG Music Entertainment (Australia) Pty Limited. Licensed courtesy of Sony Music Entertainment Australia Pty Ltd. I Want You. Mark Brydon / Roisin Murphy, Chrysalis Music Publishing / Mushroom Music Publishing, © 2003 The Echo Label Ltd. The copyright in this sound recording is owned by The Echo Label Ltd. The Echo Label is part of The Chrysalis Group PLC. Licensed exclusively to Liberation Music for Australia and New Zealand. Licensed courtesy of Liberator Music. Alone With You. Jeremy Oxley, Mushroom Music Publishing, © 2009 FremantleMedia Australia Pty Ltd.
Love Lies. Josh Pyke, Ivy League Music / Mushroom Music Publishing, © 2011 Ivy League Records. So Beautiful. Pete Murray, Sony/ATV Music Publishing Australia, © 2003 Sony Music Entertainment (Australia) Limited. Licensed courtesy of Sony Music Entertainment Australia Pty Ltd. Beneath the Satellite. Drummond / Melia / O'Gorman / Wilson, Mushroom Music Publishing, © 2010 British India, under exclusive license to Liberation Music for Australia and New Zealand. Rock It. D.Byrne, Mushroom Music Publishing, © 2010 Liberation Music. You Only Hide. Paul Dempsey / Stephanie Ashworth / Clint Hyndman, Mushroom Music Publishing, © 2001 Sony Music Entertainment (Australia) Limited. Licensed courtesy of Sony Music Entertainment Australia Pty Ltd.
Shangri-La. Box / Kakulas, Mushroom Music Publishing, © 2009 The Blackeyed Susans, under exclusive license to Liberation Music for Australia and New Zealand. One Summer. Daryl Braithwaite, Mushroom Music Publishing, © 1988 Sony Music Entertainment (Australia) Limited. Licensed courtesy of Sony Music Entertainment Australia Pty Ltd. Ordinary Angels. Angie Hart / Simon Austin, Mushroom Music Publishing, © 1992 Mushroom Records Pty Ltd. Licensed courtesy of Warner Music Australia Pty Ltd.
Stay. Dean Manning, Mushroom Music Publishing,©1996 Mushroom Records Pty Ltd. Licensed courtesy of Warner Music Australia Pty Ltd.
Start Today Tomorrow. Toby Martin, Ivy League Music/Mushroom Music Publishing, © 2006 Ivy League Records. Let’s Go Home. Paris Wells / Ryan Ritchie, Mushroom Music Publishing, © 2010 Illusive Sounds. LP(t) (ST) (See COMPILATIONS - AUSTRALIAN TV’s GREATEST HITS: S1-Tk13). LP(t) (ST)	(See COMPILATIONS - T.V. TUNES - 50 OF TV’s GREATEST THEMES: S1-Tk1).